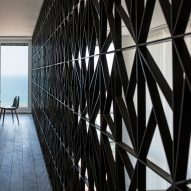 A patterned wall of black metal wraps the upper level of this two-storey apartment in Tel Aviv, designed by Pitsou Kedem Architects. 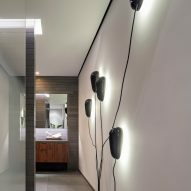 The Tel Aviv-based practice added the wall feature to the P Duplex apartment, which it designed for an elderly couple with a large collection of furniture and fine art. The aim was to make the most of the 23rd-floor flat's two levels, as well as its views across the city and towards the Mediterranean Sea. 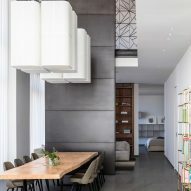 The architects' main intervention was to cut down the second-floor area to create a double-height space for the living and dining room, which now boast six-metre-high ceilings. The 13-metre-long wall of latticework made of blackened brass provides a guardrail for the adjoining hallway on the upper level. 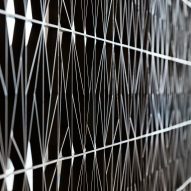 "A long, tall grate lattice, reaching from floor to ceiling, divides the second-level hall and the abyss that opens before it – the double height space of the first-storey living room," said the architects. "It functions both as an airy railing, protecting those walking on the second-level hall, while providing a view of the scenery, and, with its top band, providing a frame for the living room space." 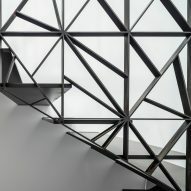 The black grate – which is made up of rectangular modules each featuring different triangular patterns – also forms a balustrade for the upper part of the staircase, attaching to the ends of dark treads that cantilever from the wall. For the lower half of the steps, the treads span the full width of the stairwell. A six-metre-high blackened brass wall partitions the living and dining room from the master bedroom, complete with en suite and dressing room, on the entrance level. "One of the special materials we used was darkened brass, which we used to create the stairs' unique balustrade with its recurring pattern and the staircase itself," said the architects. 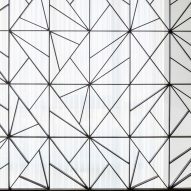 "This material was also used to create the project's central, six-metre-high wall that unites the two floors and emphasises the space's vertical dimensions," they continued. On the upper level, the wall partially covers the latticework to provide privacy for the family room, which features a metal bookstand that mimics the style of the grate. The ceilings and walls are painted white throughout the apartment, providing a backdrop for the couple's artwork and furniture, while translucent white curtains cover the large expanses of glazing. The architects chose to use dark basalt stone for flooring on the lower level, where the kitchen is tucked beside the stairwell. Upstairs, wooden floorboards cover the hallway, which features a small study with a large window and bedroom at one end. The other side houses the family room as well as two more bedrooms and bathrooms. Each of the bathrooms are finished differently. One washroom is white with wooden cabinets and a circular mirror, while another features dark stone walls and cupboards with copper-like doors. 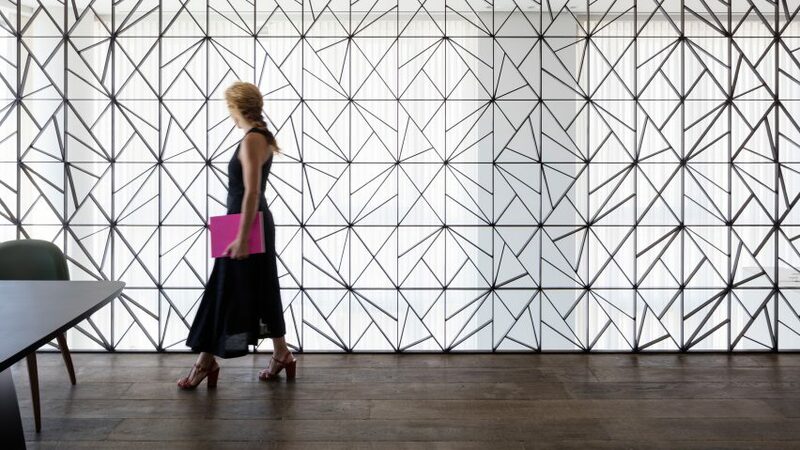 Pitsou Kedem came 39th in our Hot List ranking of architects this year. 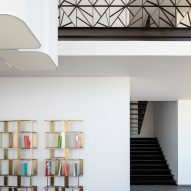 Other residential projects by the studio include a 1950s-inspired property in Tel Aviv and a family house in Ramat Gan.